The recent article "Are Wages Useful in Forecasting Price Inflation? 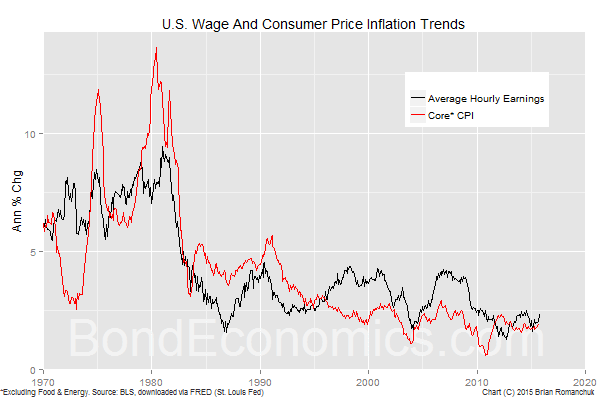 ", by Rhys Bidder of the San Francisco Federal Reserve Bank, offers an easy to understand introduction to the econometric literature which analyses the links between wage and price inflation (such as the consumer price index). I agree with the conclusion that linkage between consumer price inflation and wage inflation has not been particularly strong in recent decades, but that there a long-term link. However, I would not reach this conclusion by using the econometric tests discussed in that article, rather it follows from what we know about the structure of the economy. There have been a number of econometric analyses which have been published which have results along the line that wage inflation does not "cause" consumer price inflation, where the term "cause" is defined as a statistical test. These results have then been verbally twisted by some people into insinuating that there is no linkage whatsoever between consumer price inflation and wage inflation. A glance at the chart above would indicate that such a stance is silly, but it probably reflects other biases of the economist. For example, if there is no linkage between the labour market and CPI inflation, it is perfectly fine for the central bank to hike rates when the unemployment rate is high. The Bidder article explains how we cannot make such statements, despite the fact that the statistical relationship between wage and consumer price inflation is muddled. In my view, this muddled relationship reflects the inherent difficulty of forecasting these variables with an error that is smaller than their current volatility. When inflation rates were higher, one probably had a better chance of making useful predictions, since the volatility of inflation was larger than the model forecast errors. One of the less intuitive parts of the discussion within the Bidder paper is the relationship between inflation and the profit share. The standard way of teaching economics is to focus on microeconomic relationships, and national accounting concepts are swept under the rug. In this case, we usually think about consumer prices and wages being set in markets, and the prices are determined by handwaving about marginal productivity. However, post-Keynesian economic analysis accents the importance of aggregate behaviour, and offers a different way of looking at the topic. I will now outline how the profit share shows up within a simplified two sector model of the economy (household and business sectors, which means there is no government or foreign sectors). Assume that the economy consists of 100 workers, the business sector is treated as a single firm, and each worker produces 1 unit of goods per period. The firm initially sells the goods at $1, and we assume that we are in a steady state where all goods are sold. If the wage per period is $0.90, the firm has a total wage bill of $90. Since it sells 100 units (by assumption), the profits are $10. These profits are paid as dividends to the firm's owners, and the owners use the dividends to buy the remaining 10 units of goods not purchased by workers. The profit share of national income is 10% ($10 out of $100). If we scale up wages and the goods price by the same amount, the profit share is unchanged. Workers and capitalists will end up purchasing the same volume of units, the only difference is that the dollar values are increased by some factor across the board. If wages are increased to $0.95, but prices are unchanged, the profit share decreases. (Dividends would only be $5.) Similarly, the profit share falls if output prices rise by more than wages. The ratio of the price level to average wages tells us about the evolution in the profit share, and is the starting point for a lot of post-Keynesian analysis of the inflation process. Rather than being a question of marginal productivity, pricing tells us about the relative strength of the bargaining position of workers and businesses. If workers are more productive (for example, producing 110 units) and prices and wages are unchanged, the profit share would increase. If production rose to 110, the firm could pay $20 in dividend, and so the profit share rises to 20/110 = 18.18% of the economy. Over the long term, such productivity increases are important, and so we really need to look at "productivity adjusted wages". Since productivity is a somewhat slippery concept, I will largely abstract away from it within this article. Why do we want to relate wages and consumer prices to the profit share? Because it is generally expected to be relatively stable over time. 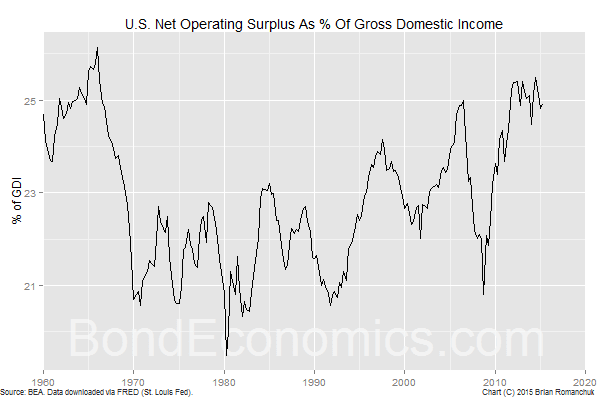 The chart above shows the evolution of the "net operating surplus" as a percentage of Gross Domestic Income (GDI) in the United States. (Gross Domestic Income mainly consists of the main categories: Compensation of employees, taxes on production, and the Net Operating Surplus.) What we normally think of as "profits" is a smaller percentage than what is shown here, as this operating surplus does not take into account things such as corporate taxes. (A breakdown of Gross Domestic Income shares is given in this interactive table at the Bureau of Economic Analysis - link.) The reason why I show this larger aggregate is that it is more directly related to the wage share of domestic income. Although we see that it has risen, the increase is not spectacular - from bouncing around 21% in 1980 to 25% in 2015. Even if the business wanted to raise profit margins by raising the price of goods while keeping wages fixed, there is no guarantee that it is possible under more realistic assumptions. There is no guarantee that business owners will raise consumption in response to higher dividends (which the analysis above assumes). In fact, it seems reasonable to expect that the (short term) "propensity to consume" out of dividend income is well below 1. If the business owners do not ramp up the volume of consumption in response to a price increase, the firm will have rising inventories of unsold goods, and a recession would ensue when it is forced to throttle back production. This mechanism ensures that the broad domestic price level cannot get completely out of line with (productivity-adjusted) domestic wages. This creates the long-term relationship between those time series that the Bidder article refers to. Although we have good reasons to expect a long-term relationship between (productivity-adjusted) wages and consumer prices, there are a lot of good reasons to expect the short-term relationship to be weak. The profit share is not constant, as seen by the 4% fall and then rise of the Net Operating Surplus share (shown in the chart above) in response to the financial crisis. It is hard to get a good handle on "average wages," particularly when highly-paid managers are grabbing a larger slice of the compensation for themselves. Capital gains create non-wage purchasing power for households. The external sector influences prices, such as the influx of cheap imported consumer goods. Energy prices are a major source of volatility for the aggregate price level, and those prices have little relationship to average wages in the developed countries. Major sectors of the non-energy components of the CPI can operate independently of the state of the labour market for considerable periods of time. Rents are driven by real estate price trends, while medical costs are driven by trends in regulation and insurance, and university tuitions follow the availability of student loans and the empire building strategies of administrators. Measuring productivity is difficult, particularly when we need to take into account service industries and quality improvements. Measurement biases can allow for a persistent wedge to appear in long-term wage and price index trends. There can be institutional factors in play. If unions seeking cost-of-living adjustments are an important part of the labour force, wages should have a lagged relationship to the consumer price index. However, this effect dissipates as the rate of unionisation declines. In the current low inflation environment, the volatility of the factors that affect the wage/price ratio can be larger than the volatility of wage (or price) inflation. Since these factors will have differing impacts, and their relative importance will change over time, the statistical relationship between wage and price inflation will appear to change. In other words, in an idealised model with a constant profit share, wage and consumer prices would move perfectly in line with each other (controlling for productivity). But if the profit share shifts, one will have a higher growth rate than the other. Since the shift in the profit share and underlying inflation trends are correlated with the economic cycle, it will appear to statistical tests that one variable leads the other. However, since there are multiple factors that affect the relationship between the variables, the lead/lag relationship will change, and statistical tests will get the inconclusive results. This matches the results of applying those tests to real world data. There is little reason to expect a strong statistical relationship between wage and price inflation at very low levels of inflation, even though we expect those variables to show a strong long-term relationship. The Bidder article shows how to arrive at those conclusions following from conventional econometric analysis, whereas I would prefer to arrive at those conclusions by looking at what we know about the structure of the macroeconomy. "Capital gains create non-wage purchasing power for households." Only to the extent that it alters the marginal propensity to consume by shifting savings around, or increasing borrowing. I'd say It's less capital gains and more increasing capital valuations that cause the wealth effect. Sorry to off-topic but do you agree with this? "Menzie Chinn of the University of Wisconsin has examined the impact of foreign purchases and sales of US government securities on ten-year Treasury yields. His estimates imply that foreign sales at a rate of $60 billion per month raise yields by ten basis points. Given that China has been at it for 2.5 months, this implies that the equivalent of a 25-basis-point increase in interest rates has already been injected into the market." No, I think that analysis is full of holes. The bond market mainly moves as a result of rate expectations, not supply and demand effects. The 10-year yield has swung around by at least 50 basis points in the past few months, solely as a result of the market changing its mind about a rate hike in December. Anyone who comes up with a precise estimate like "foreign sales raised the 10-year yield by 25 basis points" would need to come up with a model that can predict yields within 25 basis points, and they can't.